I’m excited this morning. It’s a geeky kind of excitement, but around here we take what we can get. Here’s why: yesterday we got a bit of deregulation in the financial world, and it’s a bit of deregulation that I’ve long wanted to see. So now I get to find out what happens. merchants, but not for me. Frankly, in a war between Visa and Walmart, I can’t get very excited about who wins. Under the credit-card settlement on Friday, worked out over months of negotiations, merchants can charge higher prices to consumers who decide to pay for their purchases with credit cards. A customer, for example, who buys a $100 item with a credit card might be charged an additional $2.50. A judge still needs to approve the settlement. 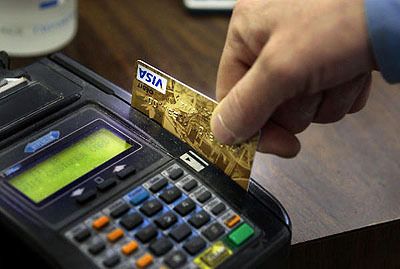 Until now, credit card companies used their monopoly power to prohibit this. Merchants could discount for cash, but their contracts with Visa and MasterCard flatly prohibited them from charging credit card customers more to cover the swipe fee — and card companies have been adamant about enforcing this prohibition. There’s an obvious reason for this: they’re afraid that if merchants are allowed to do this, people will use credit cards less. And if people use credit cards less, then banks and credit card companies make less money. But here’s why this is interesting in a geeky kind of way: it’s not clear who, if anybody, gets screwed by hidden swipe fees. After all, there’s nothing wrong with swipe fees per se: it costs money to run an electronic payment network, and credit card companies need some way to recoup those costs. Swipe fees are a reasonable way of doing this. What’s more, consumers and merchants get a lot of benefits from credit cards: consumers get convenience and merchants get guaranteed payment. No more bounced checks! Maybe a 2.5% fee is a reasonable price for those benefits. Maybe. But there are two big questions about swipe fees. First: are they abusively high? Second: who really pays them? Do they get passed on entirely to consumers? Do they get split between merchants and consumers? Or do they primarily end up balancing the costs of running a payment network between merchant and purchaser banks? Although there’s no definitive evidence on this score, there are some reasons for thinking that fees are too high and that consumers do end up paying at least part of them. There’s a Boston Fed study showing that the net result of swipe fees is to transfer money from the poor to the rich. There’s an ECB report suggesting (unsurprisingly) that in a monopoly environment interchange fees will always be set too high. And there’s this New York Times piece about swipe fees in the debit card market, which makes it pretty clear that Visa’s fees are simply egregious abuses of its monopoly power. And if they’re abusive in the debit card market, they’re probably abusive in the credit card market too. Finally, there’s the fact that current fees are so high that card issuing banks can afford to rebate a big chunk of them in rewards programs, something that flatly makes no sense in a sane world. Who knows? But one way or another, the market will figure this out, not the monopoly position of the credit card companies. And in a geeky kind of way, it’s going to be very interesting to see what happens. EXTRA SUPER GEEKY NOTE: I think that credit card surcharges are still banned by law in some states. This won’t be affected by the settlement, which means merchants will be allowed to pass along the fees in some states but not in others. This should provide an immense amount of grist for natural experiments along state borders. I expect many doctoral dissertations on this subject in the years to come.